Bravo Airsoft has manufactured internal components for a few years now, and I've done a few reviews on their products in the past. I was really impressed with what I was, so when they contacted me to see if I wanted to review their latest AEGs, I was thrilled. Their latest AEGs are budget priced entry level gun packages that come with everything you need to start skirmishing. Keep reading for more info on this interesting AEG platform, including my observations on the nice, as well as the not so nice parts! I was contacted by Jag Precision, who is the US based importer and support company for Bravo Airsoft, and was asked if I would be interested in reviewing their M4 RIS as well as their new AKS74U. I, of course, said yes, and started doing a bit of research into the guns themselves. The only info I could find was a video showing the guns being abused with a high output LiPo battery, and they took it without any issue. This impressed me a lot, so I was excited to get my hands on them to see how they do in my testing! The biggest benefit of this gun is the price, coming in at $120 at most retailers. For a complete AEG package, this is a great price that is really hard to beat. The Bravo M4 RIS is a polymer bodied AEG fitted with a V2 metal gearbox and equipped with a polymer RIS system and crane stock. When I say that this gun is polymer, I really mean it, as damn near every part including the outer barrel and buffer tube are made of plastic. Would I like a little more metal content in the gun? Absolutely, but for the price, some material cuts are to be expected. I'll go over the various parts in detail a little bit later on in this review. The M4 comes packaged in a cardboard box with a foam inner liner holding everything secure during shipping. The foam flaked off a bit and I was brushing foam off of the gun for a fair while once I pulled it out of the box. My first thought upon pulling it out of the foam was surprise with how lightweight it was. The thing is so light and easy to throw around that it's a great candidate for younger players. 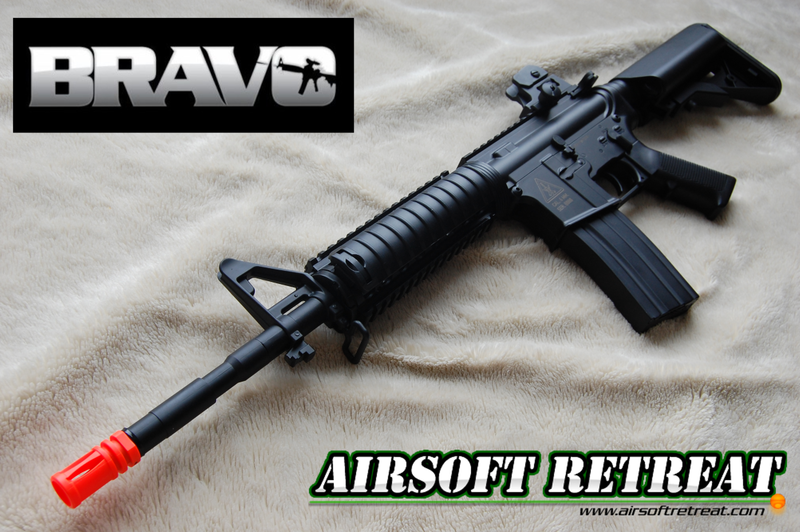 Along with the gun itself, Bravo Airsoft includes a single hi-cap magazine, battery and trickle charger, as well as a cleaning/unjamming rod and a basic vertical grip. The rail also has two rail covers installed, which is a nice touch as bare rails never feel good on your hands. As reported before, this is a fully plastic bodied AEG, as everything from the muzzle to the stock is made of plastic, with very few metal parts sprinkled around to make the gun solid. It is finished in a matte black coloring that looks really nice, however, the all plastic construction leaves a little to be desired as far as how it feels in your hands. The barrel and RIS have a small amount of flex where it attaches to the receiver, and the stock is a little loose on the plastic buffer tube, but overall, it's a fairly solid gun that doesn't feel like it's going to fall apart on you. The stock is a Crane unit that serves as the battery compartment. The gun is rear wired with no fuse or anything like that installed to take up space in the buffer tube. As indicated previously, the buffer tube itself is plastic, but it's a standard design and can be swapped out if desired. It is a six position tube, so it's certainly adjustable to fit damn near any user. Moving forward, you'll hit the polymer receiver which houses the gearbox as well as all of the fire controls. It's a standard M4 receiver, with a plastic faux bolt, dust cover, and charging handle. The two receiver halves fit well together and use hex screw secured pins to keep everything solid. The upper receiver is a standard rear tab equipped unit, so disassembly is a piece of cake. The pistol grip is a standard M4 unit with a non-ventilated, hex screw adjustable motor base. There are no major seam lines to report on the grip, and it feels good in your hand. The selector switch is located on the left side of the receiver and click well into the desired settings. The magazine catch is also made of plastic and uses a simple phillips head screw for attachment, making removal very easy. Moving forward from the receiver, you'll hit the RIS, which like the rest of the gun, is made of plastic. It has a little bit of rotational free-play, and it can easily be removed due to its two piece design. It comes with rail covers pre-installed, which is a nice touch. The outer barrel is also made of plastic, and is comprised of several pieces screwed and glued together. It's pretty solid for a plastic multi-piece design, but polymer outer barrels always make me a little nervous, especially when they're this long. The orange tip is secured with a grub screw, and when I tried to loosen it, I hear some plastic cracking, so I elected not to try and remove it. I'm assuming there are threads underneath, but I'm concerned that unscrewing the flashhider will break the barrel. Aiming the M4 RIS is accomplished using the adjustable iron sights. The rear sight is a chopped carry handle unit, made of plastic, and adjustable for windage and elevation. The front sight is part of the gas block and is adjustable for elevation. The sights are pretty much standard M4 units, so it's easy enough to use if you've ever shot an M4. The top rail is standard 20mm, so you can mount optics if you want with ease. There is a small engraved trademark located on the left side of the lower receiver, as well as a serial number that looks like it might be unique to each gun. On the right side of the receiver, there was a large Made In China sticker that was easy to pull off without leaving any residue. The included magazine is a metal hi-cap which holds about 300 rounds. It fits quite well in the receiver with very little wobble, and it feeds pretty much flawlessly. I tested other magazines including midcaps and hi-caps from JG, Echo 1, MAG, G&G, Army, Star and others without any problems with fit or feeding. Rate of fire with the stock battery wasn't great, only coming in at about 13-14 RPS, but with a Tenergy LiPo, I saw a decent improvement up to 17 RPS. Not earth shattering, but for a 100% stock gun, it wasn't too bad. Range and accuracy were really bad, until the hop-up and barrel broke in a bit. The first 2 mags had barely any hop effect, and the BBs just took a nose dive after a few feet, but after that, it broke in and got pretty consistent. Loading it up with some Echo 1 .28g BBs, I was able to easily hit my torso sized target at 145', which is pretty much standard accuracy for an M4 length AEG at this power level. Inside this gun you will find a V2 gearbox fitted with 7mm ball bearings, steel gears, and decent airseal components. Accessing the gearbox is a piece of cake, due to the standard plastic body construction. The only hiccup is with the one piece hop-up that doesn't allow you to pivot the receivers. You have to undo both pins, slide the receiver forward a bit, then pull the two piece apart. Inside the gearbox, you'll find a set of steel gears with sector chip installed, brass type 1 cylinder, nylon polymer spring guide with ball bearings, nylon piston with blue ported piston head, and a nylon cylinder head. The air-seal is quite nice, but the gearbox is coated with a really foul smelling grease. Shimming was fairly well done as well, allowing smooth firing. The hop-up is a clear plastic one piece unit with a greasy bucking installed. The inner barrel looks like it's made of aluminum and is 363mm long. Cleaning off the bucking should be a priority upon buying this gun, as the grease inside and out affected my performance. Being that this is a TM compatible M4, you can modify it to your heart's content. Personally, I don't like the fact that it has a plastic buffer tube and outer barrel, as it throws off the weight balance a bit to my liking, so I will be swapping those out for metal units, and shortening the barrel down to CQB-R length. This will be an easy operation, and a cheap upgrade in my opinion. I'm always interested in testing out entry level guns, as really, they are the guns that most brand new players are using, so they can set a player's expectations going forward in their time playing airsoft. When I started playing, there were no entry level AEGs, and in the last few years, the guns marketed as "entry level" shot up in price, coming in well over $150 most of the time. Guns like the Bravo M4 RIS fill that gap between plastic gearbox equipped LPEGs and higher quality AEGs, giving new players a way to get into the sport competitively, while still working around a small budget. 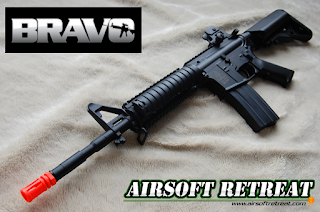 I'm really glad to report that the Bravo M4 RIS is a decent starter gun, however, it's certainly not perfect. I would gladly pay a few more dollars for a metal outer barrel and buffer tube, as those parts really tie into the solid feel of any AR platform. The flip side of this coin is that they do give the gun a really light weight, less than 4 lbs, which makes it much easier for younger or smaller players to sling around on the field. Overall, it's an interesting product that isn't for everybody, but it certainly is the perfect gun for someone out there, and will hopefully be able to bring new players into the sport.